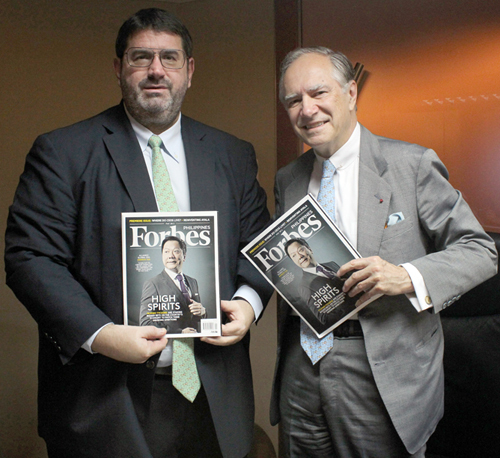 Forbes Magazine has launched a new Philippine edition. Forbes Media vice chairman Christopher Forbes and chief executive for Asia William Adamopoulos launched the publication at Makati Shangri La Hotel at an event attended by the country’s top businessmen and government figures. Finance Secretary Cesar Purisima, a guest speaker at the launch, said: “I looked at the list of 37 or so countries that have an edition of Forbes. And, we looked at the growth rate of those countries around the world. We realized that the average growth rate of those countries is 2.9 per cent, which is higher than the average world GDP growth rate of 2.3 per cent. “So I think the presence of Forbes in the Philippines augurs well because they’ve shown that they know how to pick countries. They are present in four of the ten Asean countries. In fact, they are in the largest Asean markets. Since 2010, the number of Asean billionaires has actually increased from 25 to 82. And the number of Philippine billionaires increased from two to 11. Most of them are here today,” he said.